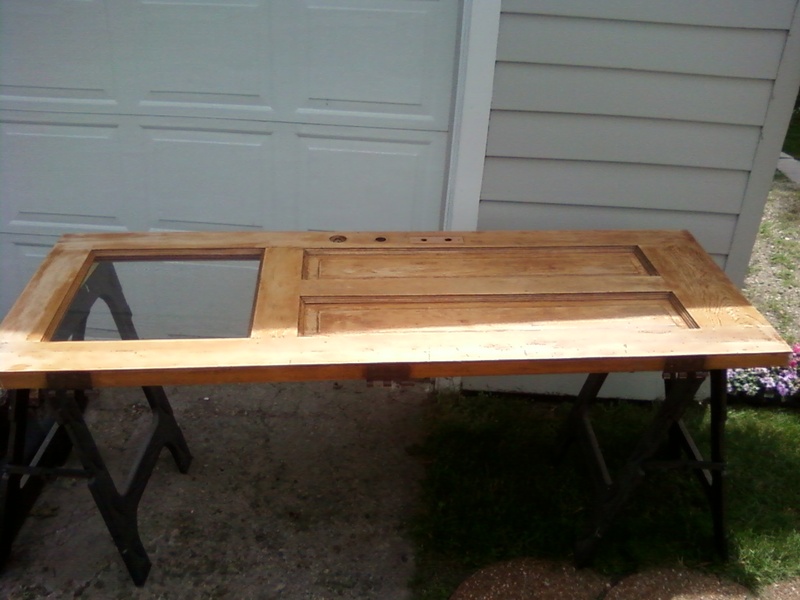 I have spent my last couple of weekends refinishing our back door, which was in dire need of a face lift. It was nicked and scratched in many places and in some areas the shellac or finish was completely gone. Its condition never much bothered my wife, as she just saw it as an entry way to our home, where friends and family are always welcome. I have been meaning to get to refinishing it for about the last 5 years, but never quite found the time and energy. To me it is the first thing people see when they come in our house. While the paint and exterior of the house is in pretty good shape, our door was beat. It needed some TLC. Understand that most people (at least our friends and family) enter our house not through our front door, but through our back. I've never quite understood why this is, but think it might be the result of where our driveway sits. It's just easier to park and walk to the back door. For this reason, I thought the door needed to be shaped up. It's a reflection of the way we care for the rest of our house, so I want it to look nice, or, at least better. Last weekend was spent doing the rough sanding. It is a very hard wood, likely oak or maple, so I used the palm sander for most of it. The panels required using sandpaper and elbow grease. While the sanding got most of the finish off, it still didn't look right. My friends recommended that I strip it using a chemical stripping agent. That was yesterday's project. I applied it, scraped it, and reapplied a second coat and scraped it again. Today was stain day. 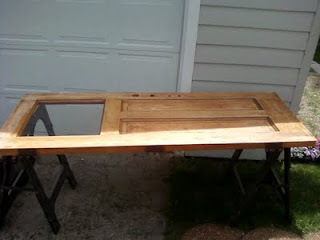 I took it off the hinges again, (I had to put it back on last night) and applied the stain evenly over the entire door. As I was doing this I began to reflect on the history of the door. I thought about all the people who have come through it over it's 90 year history (if it is the original door). The fathers and mothers. I thought about the newborn babies that were brought through the door in car seats, baby carriers and in parent's arms and the calls of "Here honey, let me get the door for you." I thought of all the emergency exits and entrances that have come through the door. Health emergencies, doctor visits, kid owies and boo boos, and the like. I wondered if paramedics had ever come through the door, or will they in the future? (Let's hope not.) The emergencies got me to thinking about all the bad news that has walked through the door. The news that someone was just let go at work, or that Uncle Phil has leukemia, or the dog has to be put down. And with the bad news, the good news that has passed through it. The engagement announcements, the excitement of a new pregnancy or a high school sports championship. I thought of the pets that have scratched at the door wanting in or out. In because they missed their family, were hungry or just finished doing their business on the lawn. It is the door that four times a day we let our dog out to pee and bark at the rabbit that may or may not be in the back yard. It doesn't matter if it's not there, he'll bark anyway. I wonder if there were ever pets that bolted through the opened crack of the door only to send the owner on a wild chase. I recalled the two times I had taken pet cats through the door in pet carriers to their ultimate ending at the pet clinic because of failing health. I thought of the mighty winter storms that this door kept out over the years. The twenty inch blizzards of January's past, the sub-zero February nights, the blistering 100 degree July days and the cold, damp March days. The door when opened reminds us of the nasty elements we leave behind, and the warmth we walk into. It acts as a barrier to the wrenching heat, and stifling cold of Wisconsin and sometimes of life itself. The elements and the people put this door in the bad condition it was in, and it is up to me to try and make it right again. The window of the door reminds me of how we look through it to see who's coming, to watch the dog rolling in something in the grass, or a rabbit or stray cat that has wandered into our back yard. I wonder if the window has ever been broken by a ball or slammed too hard in a fit or rage that necessitated it being replaced. While it's become blindingly apparent through the process that I am not a woodworker (as the refinished door is testament), it's also become clear that like all the previous owners, I value my house and want it to be a haven for friends and family. A place where we can feel safe, live life's joys and sorrows, and slowly learn how important it is to be together. The door is where it all starts.